All lightboxes are both UL and C-UL labeled. 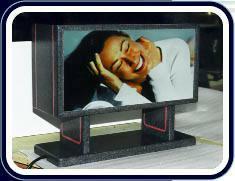 Standard lightboxes are durable ABS plastic in black or white finish. All lightboxes feature fluorescent lamps, UL labeled light fixtures with safety shutoff ballast, and six or twelve foot ground cord. We supply a white acrylic diffuser and clear acrylic face. You'll be able to easily access any transparency changes from the front which has a continuous built-in sealing edge to keep dirt out and prevent distortion in the image. 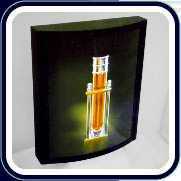 Lightboxes can be free standing, wall hung, ceiling hung, pedestal mounted, or wall recessed. The radius front face of this lightbox adds a unique effect that gives the image added depth. It is available in varying sizes from 11" x 14" to 40" x 60". The radius lightbox incorporates all features of the standard lightbox. You can choose from a wide variety of materials and styles including wood, acrylics, laminates, stones, and solid surface materials. We will create the most efficient and cost effective design for your visual marketing requirements. 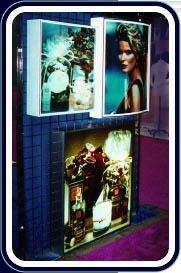 Multi-show lightboxes featuring several images on one lightbox. The custom lightbox incorporates all features of the standard lightbox. 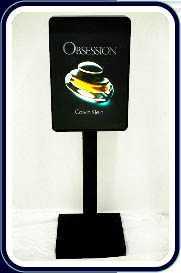 You can choose a pedestal to mount your lightbox on. These are perfect for mall or open area locations. We can furnish our standard square, round, or rectangular pedestal or you can design your own, such as a triangular or double pedestal.